We all need our own space in our home to plop down with our laptop or a clean surface to write and work.The first desk can be made in a flash. You could use a simple rectangle fold out table or have one constructed to fit in a certain area you may already have in mind. 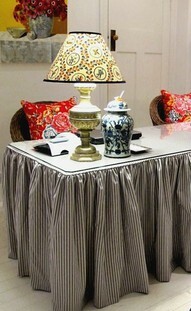 Once you have your table, pick out fabric you LOVE and have a skirted slip cover made. Burlap is a great neutral, I love the navy ticking (don't forget red ticking) any solid linen fabric would look beautiful or be dramatic and use a bright color. With fabric the options are endless. Your local glass shop can cut a top to add a smooth surface and polished look. Accessorize with a lamp that is stunning, add a frame or two and finish off your look with an inviting chair. Make it your own space by adding your personality in the mix with a collection or favorite photos and books. Of all the pictures this desk is my favorite (I'm not in love with the lamp or chairs), the fabric gives it a soft sophisticated look without appearing stuffy. The overall look is picturesque for sitting down to working on any project. I am addicted to green at the moment so naturally this caught my eye. The overall picture is dramatic and playful. Don't be afraid to paint your furniture or try bold prints. If it fits your personality and you love it, then TRY IT! Since the walls are adventurous and the green is bold and they anchored it all down with a neutral sea grass rug. Don't go overboard if it's your first attempt at bold and dramatic don't put it on every surface of the room, take note from the picture and try a pattern on one surface and a piece of furniture in a color you adore,finish with a neutral and leave out all the extra accessories. 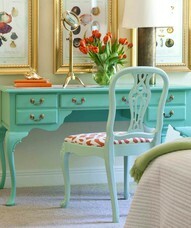 This turquoise desk could not be prettier, don't be afraid to paint. 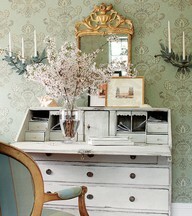 Again another simple desk with beautiful style. The wall color is graceful and the collection of framed art adds a backdrop for the desk that is uncomplicated and classy. Notice the desk is slip covered!!! If you are using neutral fabric and muted tones add a punch with a fabulous lamp or chairs. Another example of what a difference paint can make. This look is a little more formal and fussy, but still very pretty. The vase and flowers are atrocious but, the mirror and sconces are dazzling and add to the formal look of the space. What a statement. Casual living in an elegant way. 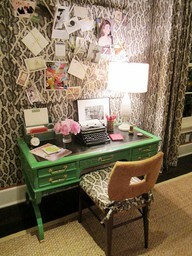 Chalkboard wall with sconces, painted desk, slip covered chair, amazing wallpaper, lots of WOW factors!! This is not your typical desk, but its definitely a workspace and a great use of one. Two fabric memo boards, a unique lamp. The red, adds a punch that is gorgeous and unexpected. Notice the red trim on the roman shade. I'm not loving the rug but the rest of the space looks personable, friendly, appealing and functional. It's proof you can make room for a work space in any home. 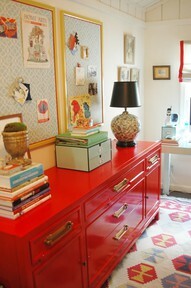 Get to work on your home office or desk, and be original, inventive and express your personality.